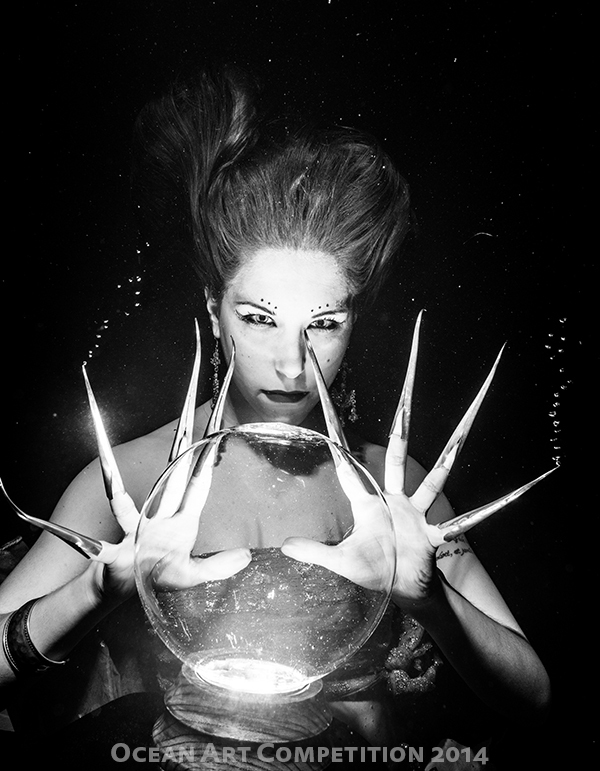 The story: This image was inspired by witches and their crystal balls, creating the metaphor to see the future under water, as if we wanted to predict the future of our oceans. The intense witch's look holds the observer in this magical underwater fantasy. As this is about light and magic, I opted for black and white to enhance the conceptual idea. The main light used was a flash placed under the crystal ball to lit inside and also to provide lighting to the model's face. Two additional in-camera strobes were used to fill lighting the body. The makeup was done by the model. Location: Indoor pool in Coina, near Lisbon, Portugal. Camera: Nikon D800, Subal housing, Nikon 16-35mm lens, 3 strobes (two Inon Z240, one Subtronic Alpha Pro).